Food, in my opinion, can be associated with various emotions. It goes beyond becoming a delicious dish. It turns into an emotional connection. Be it satiating like a paneer or chicken tikka masala, dull or uninteresting like bottle gourd (lauki) ki sabzi, or be it foodgasmic like hot gulab jamuns on a cold winter’s day. And when it comes to the peppy emotion, it need not be pasta or pizza. But can be indian based gravies too! Whenever I cook at home, I usually end up making pasta and noodle based dishes. And usually, when we order in, we call for Indian gravies that are milder in the spice quotient. So, I thought of recreating an order in peppy favourite – Mushroom Peas Masala. 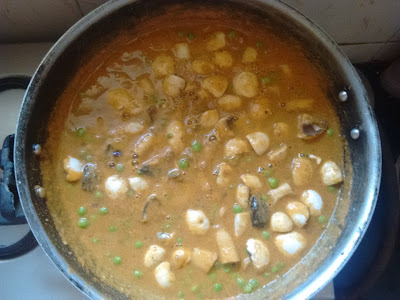 Mushroom Peas Masala is a mildly spiced gravy with tomato and onion based but is creamier due to the addition of cashew paste. It is a main course dish. A hit with the kids as they tend to love both mushrooms as well as green peas. I’ve tried this adapted recipe from Tarla Dalal’s recipe book several times and it has been a hit. Heat the oil in a pan, add the cardamoms, cinnamon stick and onions and saute till onions turn golden brown in colour. Add the tomato puree, chilli powder, coriander seeds powder, turmeric powder, garam masala and salt and cook till the oil leaves the masala. Add the cashewnut paste dissolved in 1 cup of water and mix well. You can also use powdered cashewnuts and add water to it to use it like a paste. You can have it with steamed rice, jeera rice, phulkas, rotis, naan or bread. Do try out this recipe and let me know how you liked it.